Like many tatters, I’ve tried most popular needle crafts at some point; I can crochet a little and knit, though badly, and embroider decently and sew and quilt pretty well. Now here is the contradiction. In my experience, tatting has the steepest learning curve of all of these, but, and bear with me before you run screaming to a knitting website, once learned, tatting is the easiest needlework to actually do. It’s just that blasted stitch transfer that trips everyone up. Once you’ve got that down, you’re golden. Okay, so there are a few other things to learn, but that’s the tricky one. When I was learning shuttle tatting from my grandmother, I kept going back to her and insisting “show me that one more time, Gram” till she was blue in the face. But I was determined to learn. Now, as I have been teaching quite a few tatting classes lately at Santa Fe Quilting, I’m getting a good perspective at where most people are having difficulties, and what questions they keep coming back with. So, in an effort both to give my students a way to review lessons at home, and to introduce tatting to the world at large, I’m starting this Absolute Beginner Tatting Series. Here is the very first video in the series, which starts off with the very first skill in tatting: how to wind your shuttle. There will be many more videos to come, so please give me feedback on what topics you would like to see, how the video is presented, what is helpful and what you would like me to do differently. These videos are for you, so let me know what you want. Notice that there ARE closed captions available! Yay! See you at the next video lesson! 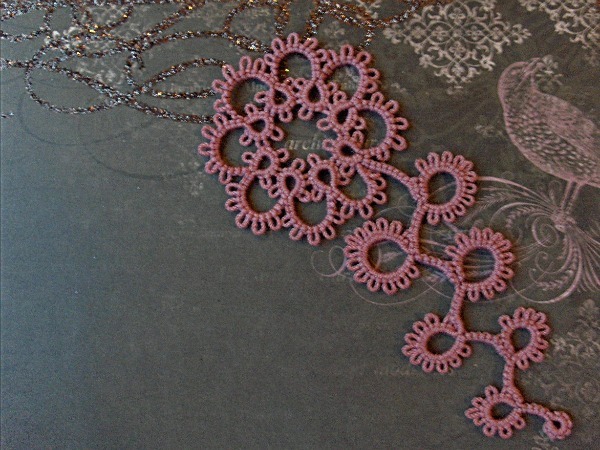 This post is the first in a series of Absolute Beginner Tatting Lessons. Jump to the next lesson, The Dreaded Double Stitch. Very nicely done! The only thing I do differently is that I knot my thread around the post at the beginning. Otherwise, I lose all control when I near the end of the thread! I hadn’t thought of knotting the end on, thanks for sharing. That would keep the end threads from unraveling, but might make the tail end unusable, and sometimes I need every millimeter of thread! Maybe a simple slip knot that you could take out without damaging the thread would provide the flexibility of both. This is great! I have a friend of a friend in England who is looking to learn to tat and this will be great help to her! Michelle, please pass this along to your friend, and there will be more to come. Next up is the double stitch. I hope it helps her! Looks great and easy to follow. Like the idea of absolute beginners. PLEASE NOTE: This video doesn’t specifically mention how to wind shuttles with bobbins, but you can do basically the same thing. Just hold the thread to one side, and wind until that end is hidden and keep winding. You can also the the thread on with a little knot, hold it down and wind. Will you be featuring any tatting using needles? I’ve found these are easier than the shuttle for tension purposes for me, but I am still a beginner and could use some tips. Veronica, I hadn’t planned on doing a needle tatting series, but that is a good idea. Thank you for the suggestion. Thank you for doing this! I sort of figured out tatting one time but once I got one circle thingie done I wasn’t sure what to do next. Obviously my vocabulary needs some sprucing up as well…..
Sue A, Funny you should mention the circle thingie. I’m actually preparing a “tatting lingo” post or two to include in the series! Stay tuned for more tatting fun. Same tat time. Same tat channel. Wonderful!!! I actually started trying to learn tatting…I even got the stitch transfer! I got the double stitch and the picot, but I couldn’t get past those to actually following patterns without someone to show me. I’m really looking forward to your series….maybe there’s hope for me yet! Anita, keep with it and you’ll be a great tatter! I will be doing a video or two soon on how to read patterns, so I hope that will help you out. Keep checking back for more interesting things…including my first giveaway next week! Thank you for this tutorail. I appreciate it is truly from the beginning. So many times tutorials skip over the beginning steps assuming everyone knows those steps. I will wind my shuttle and be ready for the next step! Mosaic Magpie, thanks. If I’m missing any steps, feel free to point that out to me. I’m so glad to have found this! Both of my great-grandmothers tatted beautifully and while I was too young to have learned before they passed away, I’ve always wanted to. My Grandma kept all of their shuttles, patterns on index cards w/pieces of the lace either taped or stapled to them, along with a lot of the threads. My Mom has those now, but I’ve thought about getting a couple of the shuttles from her to learn and then eventually getting some of the patterns too, once I have learned. I’m making a folder right now in my favorites to bookmark this! Thank you so much for these tutes. I’ve been trying to teach myself and yesterday I would have liked to shoot myself in the head. But today I found this, so I’m putting the gun away. Thanks so much for the easy to follow videos. This is my firsr attempt at tatting and thanks to your video I believe I can do this!!!! Yay! Keep at it till you DO get it. Once you get the flip consistently, the rest is easy. I’m so glad to find this beginners series. I inherited all of my Grandma’s tatting tools, and, sadly I never got to learn tatting from her before she passed away. I’m glad you had the chance to learn from yours, and I will follow along as a newbie with no prior knowledge. I can’t wait! Thank you. I am an absolute beginner with a strong desire to learn tatting. Of all the on-line tutorials that I have browsed through, yours is the most user friendly one that I have come across. It has only strengthened my urge to get started. I also came across several sites which talk of needle tatting which apparently is easier than shuttle tatting. But tatting needles are hard to come by in India where I live. Do you also have tutorials on needle tatting? Would love to hear from you. Thanks for your wonderful tutorials. Usha, Needle tatting is easier to learn, but I don’t have any tutorials on that. There are some good ones online though. Janice, Welcome to the club! Check out the links on the right side of my blog where I have some of my favorite Tatting stores listed. You can find some great handmade shuttles as well as shops that have just about anything you would need. I am beginning at needle tatting because I found shuttle in my deceased grannies goodie box she left me, and couldn’t get the hang of it. I think after watching some of this, I may give it another go. I just can’t get the hand flip right (for ds), but I think if I practice enough, I may get it! I do enjoy the needle though, just in case I can’t get this! Sewing machine bobbin and doesn’t open at the ends to that I can wind the thread. Should I just find another one or is there a way to make this one work? With these kind of shuttles, the bobbin usually comes out. Try pushing it out the side, wind it, and push it back in. 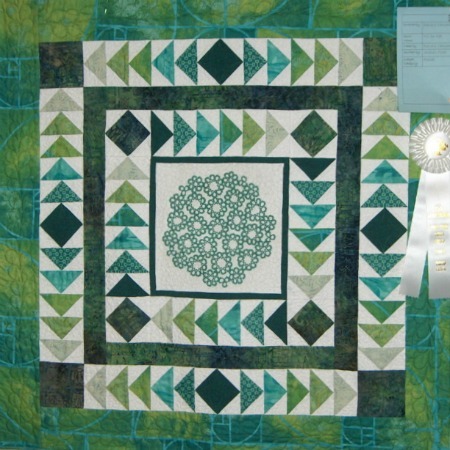 I would Love to learn, I do knit and crochet as well as rug hooking and quilting, so I can work with my hands so how do I fin the equipment necessary? I really look forward to learning to tat! Like great-grandmother did beautiful tatting. She made doll clothes and put tabbing around the underwear for the doll. She did beautiful work and was very fast. I have all of her shuttles. I bought a lot of books with Tatting patterns but I never got that good. I tried to teach myself how to do it and I forget how far along I got. I’m so happy to start this ….thanks a lot.! Excellent idea for the very beginners. I agree with your opening observation of the contradiction of tatting being one of the easiest to do but hardest to learn. A tip my dad gave me while I was struggling to learn the flip was, “use a bigger thread.” I picked up a small scrap of clothesline, and suddenly I could see where I was going wrong. I’ve been tatting happily ever since. I like to share this tip with other beginners hoping it will help. I am so glad I found your videos, I wanted to learn this over the Winter break. My mom used to Tat, but I live on a different continent then she does, so I can’t ask her. Your videos are very easy to understand and follow. I’m really glad I found your wounderful website. It’s great especially for an absolute beginner like me. I started to learn this fine art but I can’t find good resources in my country since tatting isn’t very popular here. So imagine my happiness when I came across your website. I’m 100% fan and follower so I could learn and be a decent tatter like you. Big thank you all the way from the middle east, Saudi Arabia. P.S. please forgive my spelling mistakes. Not a native English speaker. I stumbled on this site thanks to the great googletron. Freakin’ awesome is all I can say! Believe it or not, my problem is keeping the working thread taut in my left hand. Do you have any pointers? I cannot thank you enough for posting your video series “Tatting for the absolute beginner”. I have wanted to learn to tat for a long time. I still remember long ago visiting an elderly tatter, who lived up the street from me in my youth, and watching her hands just fly. I have learned to needle tat and have created some interesting items but real shuttle tatting has been my goal. I have a dress I want to embellish and have found a pattern I want to ultimately use for this embellishment for trimming the collar and lengthening the sleeves. I can hardly wait to finally get to the point I feel confident with my new skill to try it. I taught myself to tat 65 years ago. I had Coats and Clarks Learn How Book. Your video is excellent, but a few comments. I would use very large thread for such a video; size 10 crochet cotton would show up better. 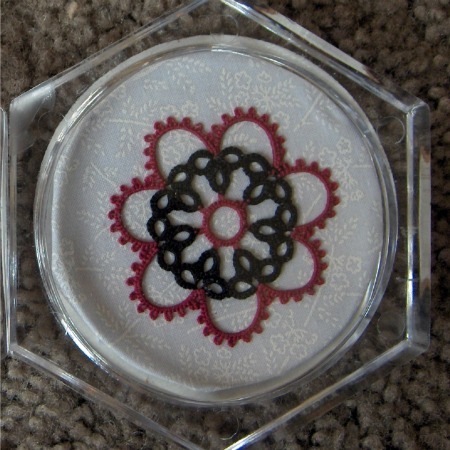 After you can see what you are doing, it will be easier to use the dainty tatting thread. Another thing, It was very good that you used two different colors, but you didn’t need the second shuttle for that demo. Just use the thread off the ball for the ring thread. I seldom use two shuttles. Only if I want a ring to come off another ring. 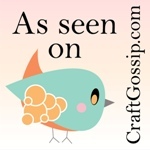 Pingback: Pretty Things | Kids, Dogs, and Crafts...Oh, My! I keep clicking on the link, but it brings me back here and not to the video. You’re probably clicking on the link for the Absolute Beginner Tatting series, not the video. If the video url doesn’t display a link, just copy and paste it into your browser window. Dear Heather, thank you so much for doing this series. I especially appreciated that you show the moves of the fingers slowly. The YouTube link is not working, I copy paste it without the brackets in YouTube and I watch from there. I came here from Pinterest needle tatting suggestions. Actually I am trying to learn how to make long and not bulky earrings for my daughter, who can only wear clips. If you decide to do needle tatting videos as well you d be an awesome teacher! I am already a subscriber. If not can you suggest a video that shows the moves in needle tatting slowly as you do? Thanks again, keep up the wonderful work!